In a world similar to our early 20th century, airships are the major mean of transportation. A group of aerial bandits, know as "Zarathustra," raids airships with fascinating skills and has angered and been feared by government forces. Yet, their target is not money or treasure: in the name of peace, they locate and destroy arms sales shipped by airships. This is the Manga version of Firefly, and I’ll explain what I mean by that below. As you probably know firefly is a cult classic TV series cut short by cancellation. It had a cast of quirky characters, all of whom were somewhat outlaws, and a world that seemed like it was building up to something more than it initially seemed. This manga also has a set of quirky outlaws in a world setting up something larger then it initially seemed, but unfortunately this series also contains an element of firefly that is detrimental. There is no freaking ending. Yeah, this manga was too cut short, was it cancelled? I don’t know, but probably yes, considering how abruptly it ended, answering none of the questions or closing a single plot thread. It’s a damn shame too, this was a very promising series from the start, it had blimp on blimp aerial combat and people in physics defying wingsuits, and it was cool! 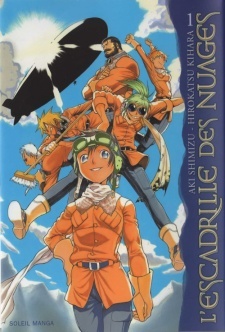 The art wasn’t the best technically, but it had a pleasing, almost full metal alchemist kind of vibe to it, and the character designs themselves were quite good; particularly the main character Koto a Short haired tomboy in aviator goggles and a military uniform… mmm baby that’s the stuff, top tier waifu right there, 10/10 would fu- Ahem, what was I talking about before? If you like blimps, alternate history, girls in aviator goggles and don’t mind it not having an ending, check it out. It seems super hipster level unknown so if that’s a selling point for you, go for it, what little there actually is of this is pretty good.